I get this question at pretty much every school I visit: Will there be a sequel? I LOVE this question, because it allows me to shout: Yes! Yes there will be! I’m working on it now, as I said in the last post. Very hard work, this editing. But for me it’s fun. I get to let my imagination go wild! The students at Charles E. Smith Jewish Day School in Maryland have offered up their help with the storyline for the sequel. Throughout the year, I heard great ideas from students, especially my buds at Washington Oak in Rhode Island (yes, I still have those scraps of paper you wrote your ideas on). But my friends at JDS actually wrote the first few chapters as a writing assignment! Oh, they’re great, really great! So many ideas–talk about imaginations going wild! And I love all the cool stuff you put into your writing. I saw metaphors, imagery, hyperbole, just like we talked about. Many of your wrote about camp or the beach, with great details, proving that when you write what you know, it comes out very vivid! Some of you included other characters from the book too. Carlos made several surprising appearances. Some of you had Arlene falling in love (hmm, little early for that maybe? :)), and many showed Arlene in a real way dealing with her leg braces. You all certainly seem to understand the message of the book–gotta live it, but not let it take over everything! I will gather all your papers and sit down at my computer to finish the sequel this summer, I promise! Stay tuned right here for some sneak peaks early next fall. To my friends at JDS–thanks for all your ideas and hard work! Keep my email and write me! Let me know how your summers go and what’s happening next year. I’d love to come back and see you! 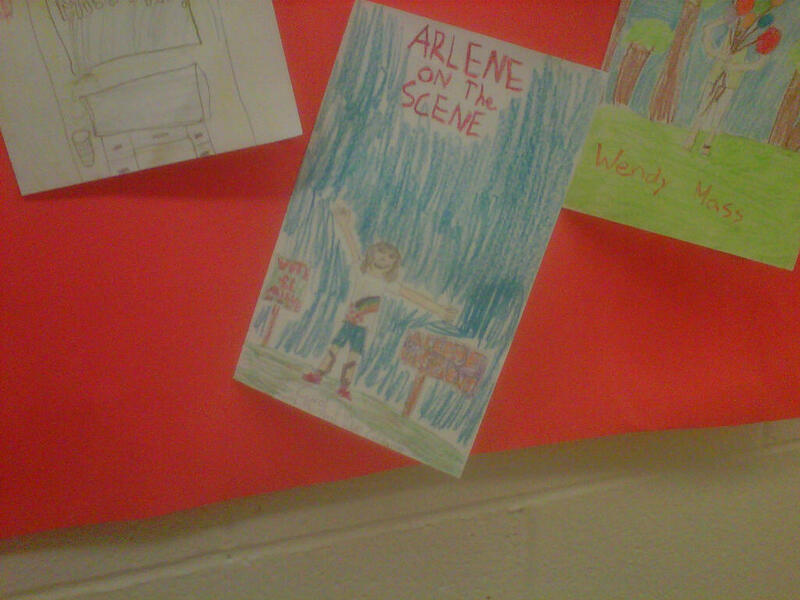 Arlene on the Scene is a fun way to introduce kids to the idea of celebrating differences, whether those differences involve ability, personality, culture, religion, whatever! Throughout much of the book, Arlene mistakenly refers to her classmates using labels based on visible characteristics. At the same time, she struggles to erase her own visible difference. By the end of the story, Arlene realizes the whole thing should be turned around. She comes to understand that there is much more to her classmates than what she can see at a glance. And she must trust that others will see beyond her disability as well. Trying to “erase” her difference only leads Arlene to further misunderstandings with her peers and a lower self-confidence within. Arlene on the Scene sends a clear message: it’s all about embracing everything that you are–strengths, weaknesses, differences, the whole package. When you are comfortable with who you are, lots of other things fall into place! From our own professional work in schools, we envision this book as an excellent way to spark discussion about disability, difference, self-concept, and a host of valuable ideas for students. Consider introducing Arlene to your local school counselor, teacher, or principal. We hope to do school visits as much as we can in our local areas. Contact us for more information!